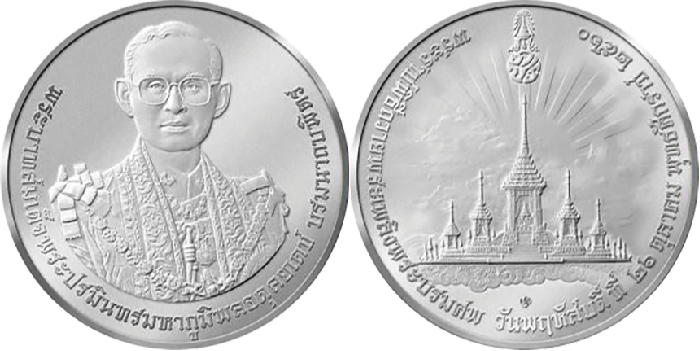 The Royal Thai Treasury, in association with the Mint of Thailand, have announced (20th August) that the anticipated commemorative medals issued to remember their late and revered King Rama IX will be made available after initial pre-orders are processed. The medals will be issued to commemorate the cremation of the king, who passed away on the 13th October 2016. It is Thai royal tradition to cremate the sovereign one year after their actual death, and this will occur on that day. 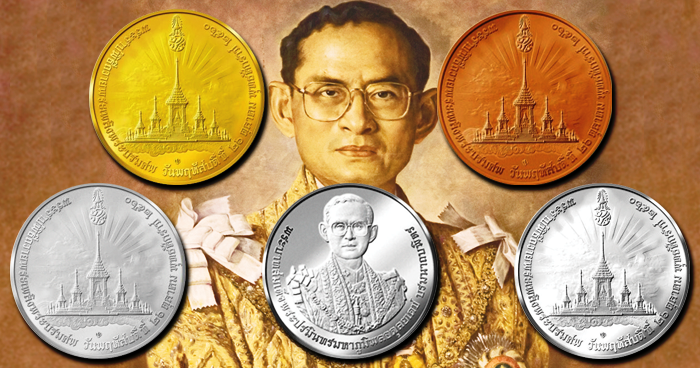 The medals, four versions in total, will be produced by the Royal Thai Mint and will be struck in gold, silver, bronze, and cupro-nickel. All will share the same obverse and reverse designs. 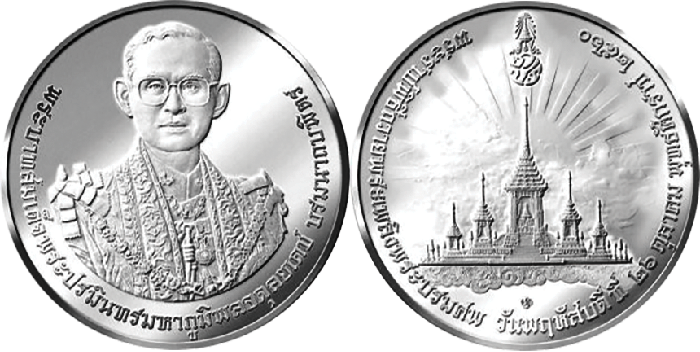 The obverse shows a front-facing portrait of the late King Bhumibol Adulyadej in full dress uniform, the robe of the Royal House of Chakri—the current royal Thai dynasty. The king is wearing the Most Illustrious Order of the Royal House of Chakri and a Chulachomklao breast chain. The late king’s name appears under his portrait. 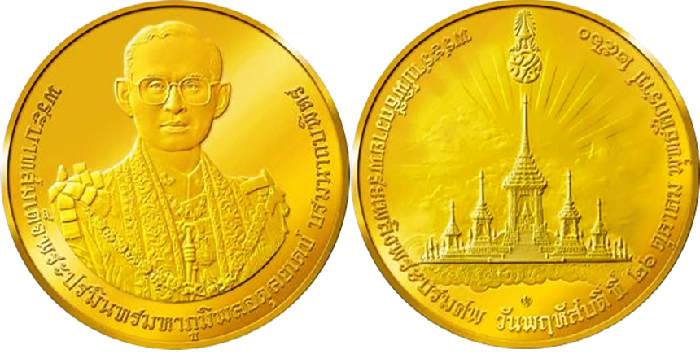 The reverse side depicts an image of the royal crematorium. The royal cypher (or monogram) of the late king is placed above the crematorium, and the words Royal Cremation and the Thai date October 26, 2017, are placed under the design in the Thai script. 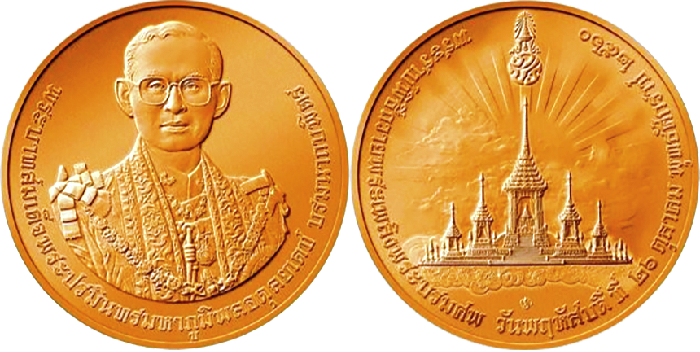 The Treasury Department will begin accepting orders for the commemorative medals in honour of King Rama IX’s cremation through commercial banks and state financial institutions from the 22nd August to the 30th September. The invitation to order the commemorative medals is extended to Thai nationals. They are scheduled to be dispatched to customers commencing on the 29th January 2018. The Royal Thai Treasury also announced that the net proceeds after expenses will be presented to His Majesty King Maha Vajiralongkorn, who succeeded his father last year. The news of the death of the revered King of Thailand, who had celebrated 70 years as his country’s crowned head of state, was received with great sorrow and deep mourning by many Thais. The official mourning period will conclude on the day of the late king’s cremation. Thereafter, the royal court will begin preparations for the coronation of the current king, H.M. Rama X, of the Chakri Dynasty. King Bhumibol Adulyadej (1927–2016), the second son of Mahidol Adulyadej, Prince of Songkla, ascended the throne of Thailand after the death of his elder brother Anada (King Rama VIII) in 1946. He was only 18 years old at the time. On the 28th April 1950, the young king married Sirikit Kitiyakara, daughter of the Thai ambassador to France. She was a great-granddaughter of King Chulalongkorn and, thus, a cousin to Adulyadej. King Rama IX and his new queen would have four children, of whom their only son, Crown Prince Vajiralongkorn (born in July 1952), succeeded his father on the 13th October 2016. During his years on the throne, King Rama IX became an immensely popular figure in Thai society and was credited with preserving the Thai state and averting the collapse of the government during a time of great upheaval in Southeast Asia. King Rama IX earned the admiration and respect of many Thais, who came to regard their beloved monarch as the father of the nation during his seven decades as head of state—the longest ever in Thai history.